On June 17, nine people were killed in the Emanuel African Methodist Episcopal Church in Charleston, S.C. After the attack, photos of alleged shooter Dylann Roof surfaced. He was holding the Confederate flag. On June 24, South Carolina Gov. Nikki Haley called for the removal of the Confederate flag from the State House grounds. “That flag, while an integral part of our past, does not represent the future of our great state,” she said at a press conference. In the wake of Haley’s speech, on June 27, Brittany “Bree” Newsome climbed the flagpole to do something about the flag herself, dangit. …but the Confederate flag went back up. Then, Monday, South Carolina’s Republican-controlled Senate voted 37-3 to remove the flag from State House grounds. That meant the resolution would move on to the House of Representatives—where the votes weren’t so certain. 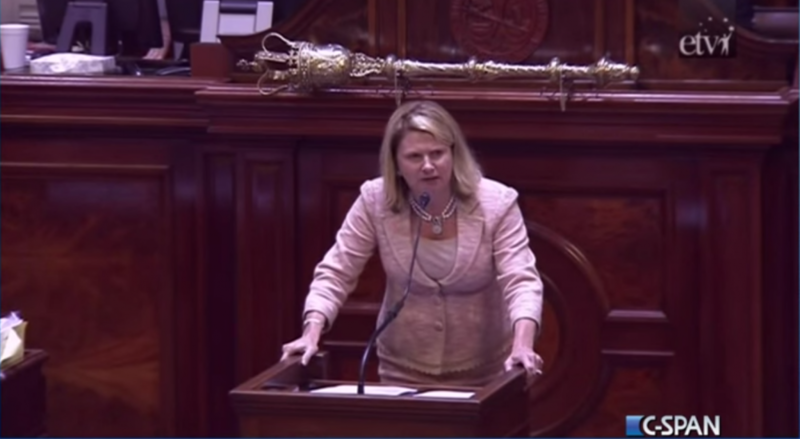 Wednesday night, after representatives had spent hours debating and voting on potential amendments, Republican Rep. Jenny Horne—who says she is a descendent of Confederate President Jefferson Davis—spoke before the House. You’ll want to watch the speech in full. Horne brought the house—and the House–down. Wow! @JennyHorne . Thank you. The House voted 94-20 early Thursday to remove the Confederate flag. It wasn't easy. It wasn't without emotion. But I'm so proud of my colleagues for doing the right thing. The Confederate flag is coming down. The measure now goes to Haley, who will hold a bill signing ceremony at 4 p.m. today, according to the Associated Press. Per the measure, the flag must come down within 24 hours of Haley signing the bill.